AYKsolutions Review 2019: Is AYKsolutions a Good Hosting? AYKsolutions is set apart from the rest of the web hosting set by its variety of server locations, high-quality infrastructure, and technical support staff. Award-winning hosting provider AYKsolutions has partnered with firms offering servers coast-to-coast in America since 2004. They allow you to choose the server yourself, and they offer the best technicians and support staff to look after your hosting needs. The cPanel provided by AYKsolutions comes in 22 different languages, which is quite rare and quite helpful if you don’t come from an English-speaking country. They offer compatibility with many programming languages including Perl 5.x, PHP, Python, C, and C++, as well as support for MySQL server and PHPMyAdmin. Getting a website online isn’t all they have to offer. Once your website is live, you can improve its performance thanks to the statistics supplied by tools including Webalizer and Analog, plus other FTP statistics. You can easily add multiple domains to your hosting account at AYKsolutions. The three packages allow you to host 5, 10, and 15 websites respectively, supported by 3, 5, and 7 databases in each package. I’d personally prefer more databases for users who need them. Thanks to their redundant multi-homed network, you can expect a 99.9% uptime. Backups receive priority at AYKsolutions as they implement a redundant backup strategy both on-site and off-site to ensure you can always access your data if the main website goes awry. Before we move to the main packages, it’s worth mentioning that AYKsolutions has separate budget hosting plans called AYKxxs, AYKxs, and AYKs. These feature 30 MB, 60 MB and 120 MB of disk space respectively, as well as 1 GB, 2 GB, and 3 GB bandwidth. These packages only allow one domain, one database, one FTP account, and one subdomain, but otherwise include all the other features of the standard hosting packages. The standard shared hosting packages are called AYKbronze, AYKsilver, and AYKgold. The disk storage offered in these packages is slightly disappointing at 900MB, 1500MB and 2100MB respectively. Disappointing because it is possible, for the same price tag, to get unlimited disk storage elsewhere. A similar restriction on databases will discourage users, because (for example) it’s difficult to host 15 websites with just seven databases. While somewhat disappointing, the packages do at least come with a 30-day money back guarantee. AYKsolutions doesn’t have live chat, so you have to get in touch with them via email, phone, fax (remember those?) or their online forum. They promise a response within 20 minutes, which to some extent makes up for the absence of live chat. The forum isn’t as active as one would ideally want, but it is still an option, and the associated knowledge base does include some great resources. While AYKsolutions promises a high quality of service, their hosting plans lack the features one takes for granted these days. Unless you are signing up specifically because of the tools they offer, you’ll find it really hard to manage multiple websites with the limited resources you get. 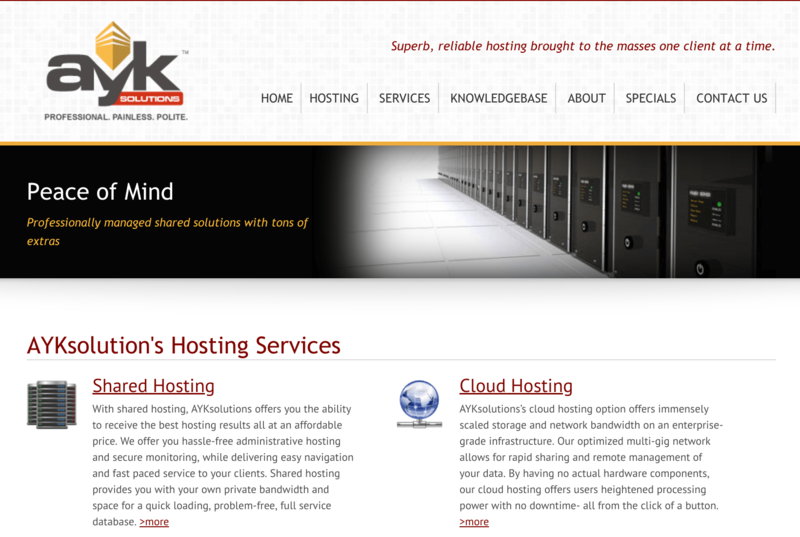 Wondering how AYKsolutions stacks up against other Web Hosting companies? Enter any other Web Hosting company and we will give you a side-by-side comparison.